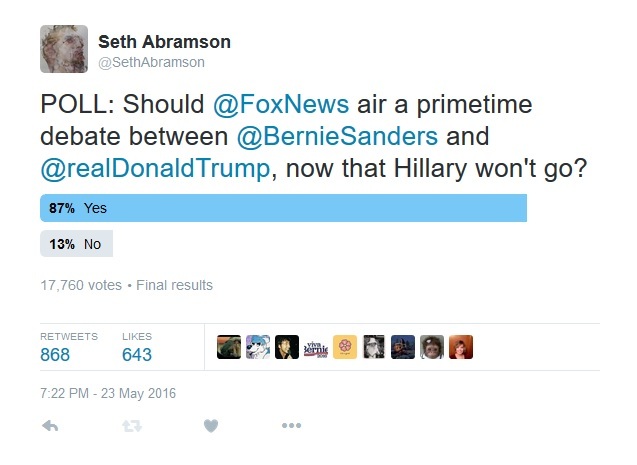 In early March, Fox News Channel almost made "primary debate history," according to an article in The New York Times. The conservative cable network now appears poised to do in May what it was unable to do two months ago. The idea back in March was to conduct a televised Trump-Sanders debate -- the first ever debate between two presidential candidates prior to both of them having received their respective parties' nominations. As reported by the New York Times, there was no impediment to the debate (for instance, pressure to squelch the idea by the Democratic or Republican parties) other than Mr. Trump's inability to participate due to a scheduling conflict. Senator Sanders accepted the invitation by the Fox News Channel and was set to debate Mr. Trump until the latter cancelled his appearance. Now events have conspired to make possible in May what nearly happened in March. With whispers of a Trump-Sanders debate growing on the internet, some are saying it could be the Debate of the Century -- a brief taste of the only alternative left to a dreary, historically nasty general election between two widely disliked politicians. But would the two candidates now being contemplated for a primetime debate accept, given that one has secured his party's nomination and the other is still in second place in his? Would their respective parties kick up dust over the possibility of a Trump-Sanders debate in a way they did not two months ago? 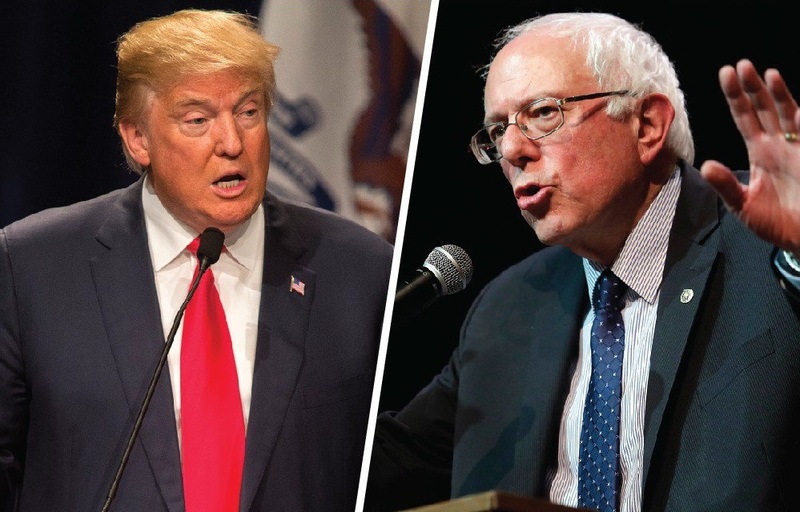 Even the mere possibility of a Trump-Sanders debate has electrified the internet. Over the last 24 hours, Twitter's polling application managed a poll that returned the following results: in response to the query, "Should @FoxNews air a primetime debate between @BernieSanders and @realDonaldTrump, now that Hillary won't go? ", 87 percent of respondents answered "yes," and 13 percent answered "no." Well over 17,000 discrete Twitter users participated in the survey, which was open from approximately 10:30 PM ET on May 23rd to 10:30 PM ET on May 24th. Meanwhile, a Change.org petition requesting that Fox News host a Trump-Sanders debate recently received more than 3,500 signatures in about 72 hours. No one doubts a Trump-Sanders debate would make its prospective cable host as much or more money than any debate this election cycle, perhaps any political debate in American history. But how did we come to a place where thousands online are seriously discussing a debate between the Republican front-runner and the current second-place candidate on the Democratic side? The answer that question is sure to delight Trump supporters and leave a lingering bad taste in the mouths of those in the Sanders camp. After agreeing to debate Bernie Sanders in California prior to the June 7th Democratic primary there, Hillary Clinton has now reneged on her promise and refuses to debate her primary opponent at any time, in any place, or under any format. Sanders had already accepted his invitation to the agreed-upon May debate in California, which would have aired on Fox News had Clinton agreed to it. While buzz immediately spread on social media that Fox News might consider replacing Secretary Clinton with Donald Trump, the presumptive Republican nominee, many assumed that individual party rules would forbid the match-up. The March reporting by The New York Times suggests otherwise. Moreover, even the worst-case scenario for Senator Sanders -- a declaration from the Democratic National Committee that his participation in any non-DNC-sponsored debates would preclude him from further debates with Clinton -- would have no real effect, now that Clinton has taken any future debates off the table. Moreover, Clinton's violation of the two Democratic candidates' previous agreement regarding debates arguably gives Sanders much more leeway than he had in March to seek satisfaction from outside the Party. If the DNC has no plans to enforce the previous Clinton-Sanders detente -- and it appears it does not -- it would have little standing to bar Mr. Sanders from seeking satisfaction through other channels. The benefit to Trump of showing up Clinton by debating her rival instead of her, and the benefit to Sanders of appearing presidential by debating the Republicans' presumptive nominee, are both self-evident; indeed, even should Trump and Sanders merely force their respective parties to weigh in on the idea with a definitive "no," arguably it would benefit Trump by emphasizing his anti-establishment bent and Sanders by confirming his narrative regarding DNC interference with the Democratic primary -- as the DNC would surely struggle to explain why it plays no role in enforcing agreements between its own candidates, but might have a role in precluding Sanders from debating an out-of-party politician of his choice. That a single Trump-Sanders debate would be both unprecedented and historic is beyond question, as is the fact that this would be among the most-watched debates in American political history -- the opportunity to let Americans see Trump and Sanders tilt at a time when Sanders is still alive for the Democratic nomination, and leads Trump by double-digits nationally and by mid-single digits in almost every battleground-state poll, would seem too good to pass up for both Fox News and for the two candidates themselves. The only question is, will Fox News again extend this invitation to the two candidates, if only to see how they respond and what ripples it sends through the political blogopshere? legitimizing Sanders at a time he could beat Clinton in California. a chance to prove to Democratic super-delegates that he can withstand Trump's attacks. And of course there are still other advantages to the two men besides these dozen. An alternative suggestion also gaining traction on social media is for the two politicians to hold, if not a debate, at least a joint town hall on Fox News -- with each answering the same questions -- in the event Republican and/or Democratic Party guidelines are somehow marshaled as an excuse not to hold a formal debate. Of course, neither party, nor any of its candidates -- apparently, Clinton excepted -- would want to be seen publicly ducking a debate with their political opponents. Seth Abramson is the Series Editor for Best American Experimental Writing (Wesleyan University) and the author, most recently, of DATA (BlazeVOX, 2016).